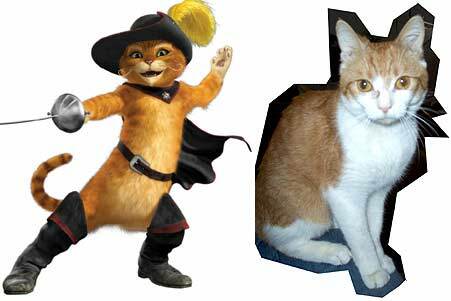 I went to see Shrek 2 yesterday (fantastic, please go see it, you will love it) and the Puss in Boots character (above left) reminded me that I hadn't posted gratuituous cute cat pictures of my new kitty Riley (above right). (Don't worry--Mombi's just fine, but my parents missed her and wanted her back). I got Riley from the wonderful folks at KittyKind over a month ago, but the poor furry orange thing has only been living with me for a week now, as several days after I originally brought him home he developed kitty pneumonia, and spent several weeks at the shelter vet on an IV unable to eat on his own. He actually came with the name Riley, but by happy coincidence that's also the name of a certain thuggish young cartoon character. OK, enough sappiness. I have to go cuddle with my cute furry baby kitty now and ponder how to capture Reagan's shameful legacy in a hardhitting yet tasteful cartoon. Hmmm.